Microsoft Word includes readability statistics. They are available in the Proofing Options screen. The Averages section identifies how many paragraphs and sentences may be too long. The Readability section alerts when sentences should be rewritten in the active voice and provides an estimate of the grade level of the writing. The readable.io website offers is another option for readability testing. Their reports show additional statistics and scores that are not available in Microsoft Word. The readable.io report also has a built-in highlighting engine showing areas where your text might be improved. Want to better understand how someone with a cognitive disability will view your writing? WebAIM created a Dyslexia Simulator and Distractibility Simulator you can try. Here are some simple accessibility tasks anyone who creates Microsoft Office or Adobe PDFs can complete. Use the styles dropdown menu on the home ribbon instead of the b and i buttons to create headers and emphasized text. Right Click images to enter alternative text for the visually impaired. Also, when creating links in documents, go to Insert > Hyperlink and enter text to display. Run the Accessibility Checker in Microsoft Word. The button is located on the Review ribbon. Set up Word (with Acrobat installed) to improve accessibility of PDF export: File > Save as PDF > Options > Enable Accessibility and Reflow with Tagged Adobe PDF. Use "Full Check" from the Adobe Acrobat Tools > Accessibility pane. Analyze the design of graphics, brochures, web pages, posters, and other artwork in color blindness simulators. Audio and video should include written transcripts for people with hearing disabilities. The transcripts can be displayed in a separate document or within the media as closed captions. 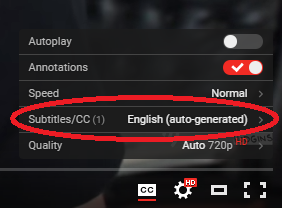 Videos uploaded to Youtube can be automatically captioned. Web Developers should be aware of accessbility strategies when writing code. Some of the more common overlooked mistakes include missing alt attributes in image elements, missing label elements for form fields, and pages that are difficult to navigate with a keyboard. Read more information online about the W3 and WCAG accessibility initiatives. Try the Web AIM Screenreader Simulation to learn how the blind surf the web. Test your completed pages in the WebAIM Accessibility Evaluation Tool. Excellent accessibility resource compiled by WGBH. PowerPoint notes from 2016 Boston Civic Media conference presentation. Online civic technology mazazine from Civic Hall, with articles about using technology to connect people and improve governments.